Login to your SOCS control panel. From the menu select the Sports & Teams, Fixtures & Results. Select the correct season and then click the Add Sport or Add Team button. Note: If you have already setup teams for a previous season then select the Season Setup Wizard, which will help you quickly setup your teams based on a previous season. Click the Save button when you have completed the Add Team details, shown in the screenshot below. More help can be found via a ? button. Duplicate teams at the same age and level cannot be created. For example, it is not possible to have two U13A teams playing the same sport, but you can have U13A, U13B, U13C, U13D etc. A grade from A to L can be assigned for any age level. You can select teams based on the age level settings of your school. If you find you cannot add an age level then get in touch and we will update the age level settings on the SOCS platform. For Rugby, the boys 1st XV would be setup as “Boys-U18A” and the team name might be “Boys 1st XV”. For Prep and Junior Schools the 1st XV might be the Boys-U13As. For Football, the girls 1st XI team would be setup as “Girls U18A” and the team name might be “Girls 1st XI”. For Hockey, your girls U13s team would be setup as “Girls-U13A” and the team name might be “Girls U13A”. You cannot add a duplicate team at the same age and level. For example you cannot have two U14A teams. If you have two (or more) teams at the same age then create A and B teams. For example U14A and U14B. All teams have an age level setting AND you can assign a Team Name to every team. For example your U13As can be called the 1st XI and your U13Bs can be called the 2nd XI. Ensure you do not select an age level for a team and then assign a conflicting team name !! 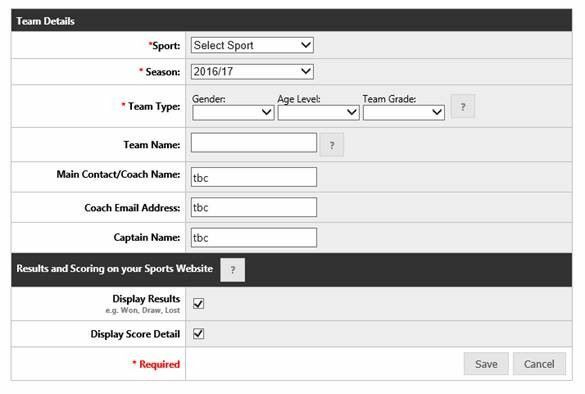 For example DO NOT select an age level as U13A and then assign a team name to it as the U13Cs or U11Ds!! This might seem obvious, but it can happen and the system, in most cases, provides an alert if you have made this error when assigning a team name. When you view your Sports & Teams Overview, any sport which has fixtures that have already taken place where the results are missing will be notified with an exclamation sign. If you see the exclamation sign then click it to quickly add the missing results.